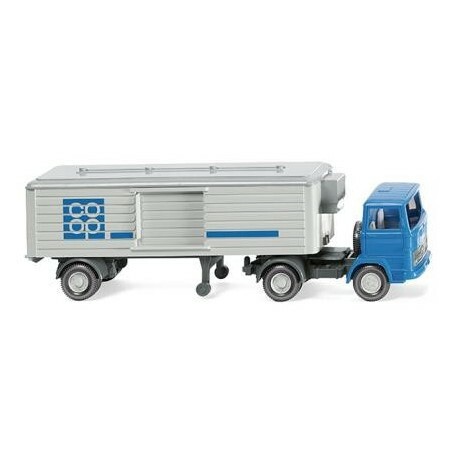 Refrigerated semi-trailer (MB LPS 1317) 'coop', 1965. Traction unit cab sky-blue, interior light grey. Chassis with Cardan part and fenders basalt grey, wheel rims light grey. Fifth wheel plate silver. Front headlamps hand-painted. Trailer chassis, support feet and rear fender basalt grey, box and side door in light grey. Box roof and refrigeration unit silver-grey, wheel rims light grey. Box sides with sky-blue Coop logo and same colour ornamental stripe as an adaptation of the WIKING classic design.